The first mate and I live at around 48 degrees north latitude, which means that we don’t get a lot of hot weather. We have four distinct seasons and enjoy them all. It will get to around 100 degrees for a couple of weeks in August, but that’s as hot as it gets. The rest of the summer is in the 80’s and 90’s. Mrs. $tingy is susceptible to heat exhaustion. She had a close call once while we were anchored out one summer after a full day of cruising on a clear, hot day on Lake Coeur d’Alene in Idaho. We took all of the appropriate precautions. She tried to stay in the sail shade most of the time, drank plenty of fluids, took breaks below deck, etc. but it only delayed the inevitable. All that to say that consistent shade in the cockpit is more than just a luxury for her, it could mean the difference between a great weekend of cruising and one cut short by making a beeline for home or worse, the emergency room. I hadn’t seriously considered adding a bimini to Summer Dance until after that episode. Before I go any farther, a bit of legal housekeeping. This post contains affiliate links. That means I receive a small commission if you make a purchase using these links. Those commissions help to pay for the costs associated with running this site so that it stays free for you to enjoy. For a complete explanation of why I’m telling you this and how you can support this blog without paying more, please read my full disclosure. 73″-78″ wide mounts easily on the deck outside the coamings. You can also install it on top of the coamings but you will need to shorten the top to clear the boom. 46″ high, which is 10″ higher than most biminis sold for the C-22. I wound up shortening the frame by 5″ to not interfere with the boom but we can still stand up under the cover. I purchased the top in gray to match the non-skid surfaces on our deck. Later the next summer, I sewed the blue Sunbrella cover that you see in the picture above and a boot to match the rest of our canvas. For maximum versatility while under sail and at anchor, I mounted the frame onto Carver 36″ tracks (not included) just outside the coamings. This leaves just enough deck width to walk forward around the bimini when necessary. The tracks let us position the bimini in the middle of the cockpit while under sail to shade most of the seating area. Middle, sailing position with support poles in the forward jaw slides. Note the ample winch and main sheet clearance. We can slide it to the rear and fold it down onto its support poles when at a dock or at anchor and board or walk around in the cockpit without it being in the way. Rear, loading and docking position with support poles in the rear jaw slides. Note the lack of winch and main sheet clearance. To get it completely out of the way without detaching it, we can slide it all the way forward, fold it down, and it will pivot forward onto the cabin roof in the space between the pop top and the mast. The rear support poles really add to the cover’s versatility, particularly with the top folded up in the rear position. 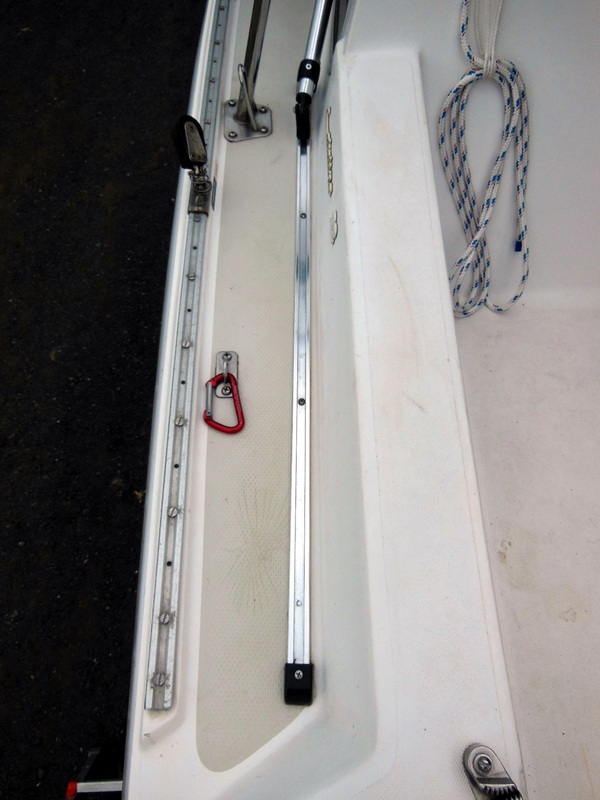 They replace the typical rear straps that would otherwise need to attach to the pushpit railing, right in the way of the main sheet and operating the outboard. I mounted hinged jaw slides (not included) on the sides of the pushpit railing, one pair forward for the mid-cockpit bimini position and one pair rearward for the rear cockpit position. The slides aren’t used when the bimini is in the forward position. 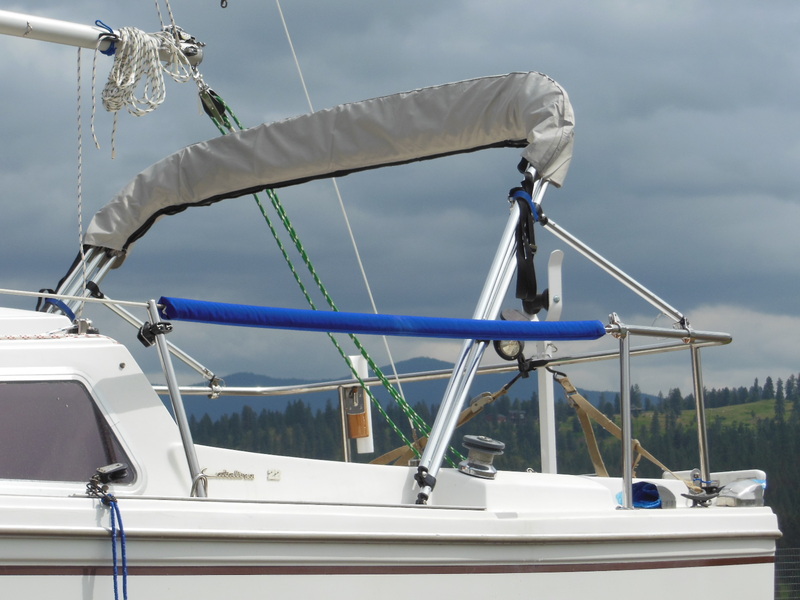 When attached to either pair of slides with tethered quick-connect pins, the bimini is very stable in both locations and takes less time to set up than having to adjust straps. For front supports, I kept the nylon straps but replaced the double-D type buckles with cam buckles so that I could quickly and easily lengthen or shorten the straps depending on which set of jaw slides the bimini is attached to. I mounted the included eye straps to the existing screws for the pop top dogs, so no drilling was needed. Detach the vertical tubes from the frame so that you can work on them. Drill out the aluminum rivets that hold the bottom hinge fittings in the ends of the tubes and remove the fittings. Cut the tubing to length with a metal cutoff blade in a miter saw. Use a hacksaw if that’s all you have and file the end flat and smooth. Drill new holes in the tube and reattach the hinge fittings with new rivets or sheet metal screws. Mrs. $tingy loves the bimini and when she’s happy, I’m happy and we can keep cruising. But 30″ tracks would probably also work. In their aft-most position, I usually have about 6″ of unused track. For it to work like I described, the important thing is that the bimini can slide forward enough to lay down between the mast and the pop top. With the bimini frame attached, position your tracks with their forward ends in that location and then check that, when the bimini is raised in its aft-most position, the bimini is as far back as you want (but not interfering with the backstay) and the frame doesn’t interfere with the winches. Note: The preceding are affiliate links. If you use these links to make a purchase on Amazon, I will receive a small commission that I will use toward the cost of administering this blog. The cost you pay to Amazon is the same but I’d appreciate your support if you enjoy this blog. If you prefer to not use these links, just go to the Amazon home page and search for the item names shown above. Good luck on your projects and hope to see you again here! Out of curiosity, how/where did you shorten the frame by inches? Seriously considering this but I am nervous about cutting the frame in the wrong place. I added a list to the end of the post with the steps I used to shorten the frame from the bottom. I hope they’re clear enough to calm your nerves. If not, feel free to ask more questions. It’s pretty easy, really. Just be sure the amount that you want to shorten it is correct before you cut it down because you can’t easily lengthen it again. I actually cut down the main bow tubes by 3″ at first and reassembled the frame to test whether that was short enough. Since the frame is angled, it resulted in less than 3″ reduction in height. The boom rubbed the top of the bimini a little so I cut it down again by 2″ more. The only complications that I encountered by doing this was: 1) It lowered the front bow to where it was sometimes in the way of working the winches. I fixed that in the same way by raising it’s hings fittings back up the frame a couple inches and 2) That move made the three bows not line up on top of each other as closely when the bimini is folded. The boot is tighter to put on but it’s not a showstopper. If I want to resolve that, I can just shorten the front bow accordingly. Thanks for your comments. I hope to see you around more in the future! Very well administered site with great info. I appreciate your attention to detail and cost savings. Thank you for the advice. I also live in Cd’A my wife and I are in the process of buying a catilana 22. Its a little warm early this year as you know I think a Bimini will keep my girls happy. Hope to see ya out there I’m sure we will be chilling off arrow point watching one of our great sunsets. We’re cruising around the north end of Lake Pend Oreille this week and will be down in the south end next week. We also visit Lake Cd’A a couple times each summer. If you ever see us on the water, stop by and say Hi! Does that track screw right it to the side decking? It doesn’t look like it would be easy to get to the underside for backing hardware. Yep, no fasteners on the underside necessary. Just put a little butyl tape around the screws to seal the deck penetrations. Your blog is a wealth of Catalina DIY information, with a great emphasis on cost reduction! You’re most appreciated! My ’77 Catalina 22 never had a stern pulpit installed. I intend to purchase the bimini top from the link you provided, along with the tracks. Will the rear support poles be long enough to surface mount along the stern, or close to on each side? I wasn’t sure if you had to shorten your rears quite a bit to mount to your pulpit, or if they arrived that way. Also, any recommendations on where to buy the tethered quick-connects? They aren’t long enough to reach the transom but they can definitely be attached to the tops of the coamings farther forward. Here’s a link to some quick pins with lanyards: http://amzn.to/2l5YhrJ. My boat came with a really nice canvas from a bimini, but no frame. In addition there are tracks run on the coaming already. When I measured from the coaming to the boom I got about 34″. A little geometry tells me that if I reduce the length of the frame to 54″ inches by changing the angle of the outer two poles without changing the length of the poles, the height will increase to 34.6″. What do you think of using this frame with my existing canvas? Will the frame work with my canvas? Will I probably end up shortening the poles like you suggested? 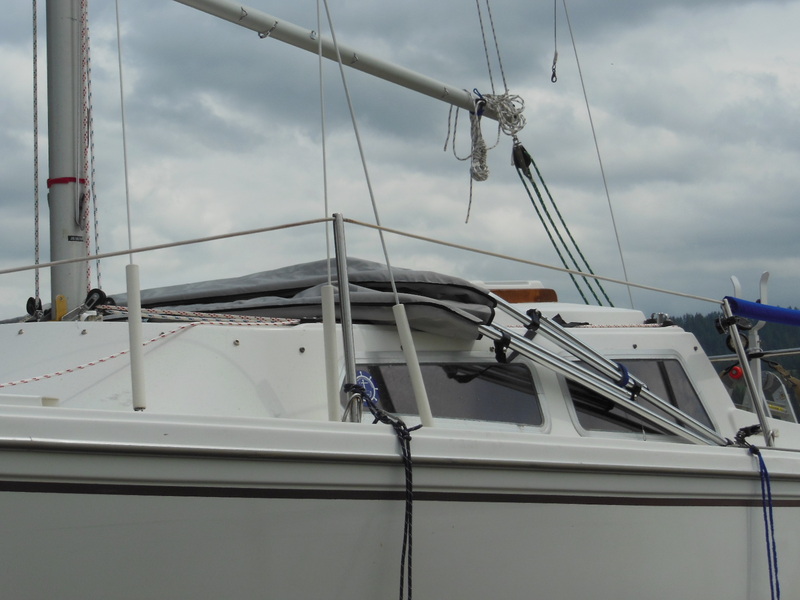 BTW, the boat I just bought (an O’Day 20) is called “Just Enough,” perfect for this blog. That frame will probably work, Dave. 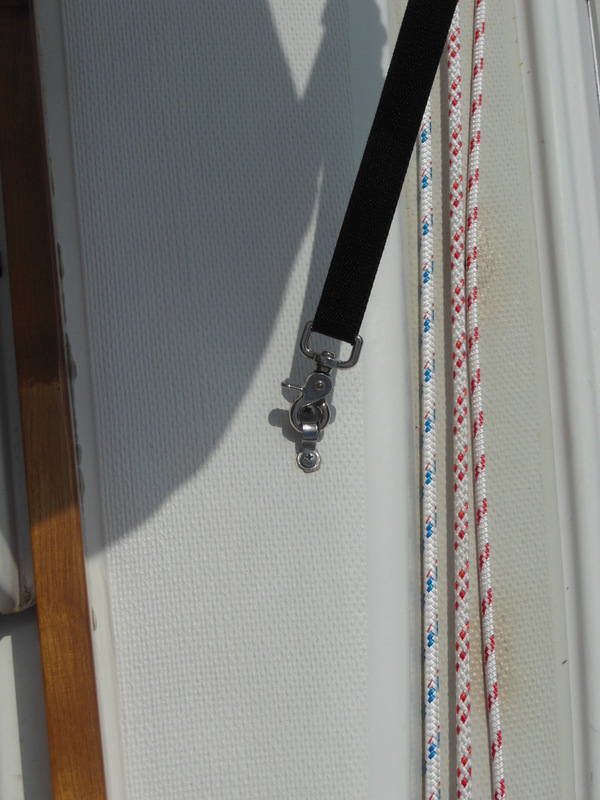 The canvas should slide right on and will limit the length of the bimini. Then you might need to shorten the bottom of the main bow a couple inches to clear the boom. Mock it up on your boat first without cutting and see. 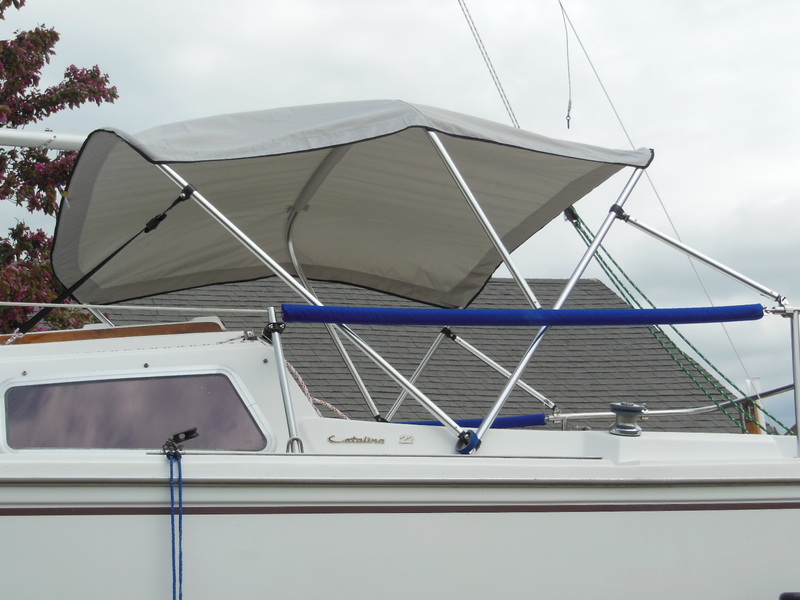 You might discover that you don’t need to cut at all if you tilt the bimini slightly forward or backward so that the middle bow isn’t the high point. The resulting headroom at the front or rear might work better for you as well.